If you're a fan of Open All Hours (which airs during Afternoon Tea on Monday afternoons at 1pm), I thought you might be interested to know that the shutters have been pulled up and the store is open again! At least for a little while, following a hit one-off revival that aired in the UK last Christmas Day. 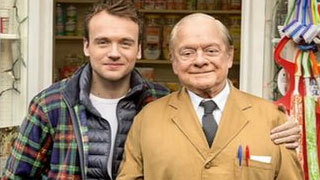 The Christmas special, aptly called Still Open All Hours, was such a hit with viewers that the BBC commissioned an entire series. Filming got under way in September. The interior scenes began filming a couple of weeks ago at Teddington Studios, in front of a live studio audience and they should be completed by November 21st. Instantly recognizable in the Christmas special was the brass band theme tune, the finger-snapping cash register and the closing time monologue from the original series. 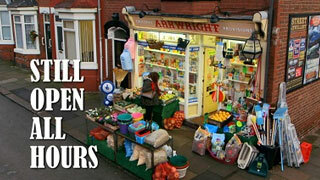 Also, even though the show has been off the air for 30 years, the same end-of terrace shop used for Open All Hours was once again back in business as the exterior of Arkwright's grocery store. The shop in reality is Beautique hair salon in Doncaster, South Yorkshire. The former owner of the salon, Helen Ibbotson, who is now 82, passed it onto her daughter when she retired 15 years ago. Before being opened up as a hairdressers in 1962, the shop was ironically a greengrocers and Mrs. Ibbotson remembers her husband having to clear tinned goods out of the cellar. 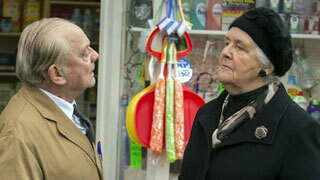 Sir David Jason and Stephanie Cole. When Mrs. Ibbotson was first approached in the 1970s about using her hairdressers for what would become one of Britain's most well-loved comedy series, she thought it was a joke. Eventually the producer who had called managed to persuade her he was serious and she agreed to rent out the salon. A fake shop sign was fitted, tins were stacked in the windows and vegetables and cooking pots were piled on tables outside. That'd last for about three weeks at a time, as Beautique was transformed into Arkwrights. The BBC not only paid for the use of the salon, but once when they needed it at a particularly busy time, they rented out another salon "just up the road" for Mrs. Ibbotson to attend to her customers. Ronnie Barker as Arkwright and Lynda Barron as Nurse Gladys. Sadly the one thing missing in the series revival is Ronnie Barker as the grouchy Arkwright. He died in October, 2005 at the age of 76. Roy Clark who wrote the original series, penned the Christmas special of Still Open All Hours in just two weeks. In it, the much put upon Granville, played by Sir David Jason, is now in charge after inheriting the shop on Arkwright's death. Granville now has a son, the result of a one-night stand (imagine that if you can! ), played by actor James Baxter. Lynda Barron is back as Nurse Gladys Emmanuel and also reviving her role in the original series is a familiar face to MPT: Waiting for God's Stephanie Cole, who plays the "Black Widow", Mrs. Featherstone. We'll be sure to let you know if and when Still Open All Hours is made available this side of the pond.